Ever since Oreo and Ford posted now legacy social media posts real-time during the 2013 Super Bowl, brands have been scrambling to be the next winner. Target took this on last night on MTV’s VMAs. At the close of the highly talked about performance by Justin Timberlake, Target connected with reminiscing young adults of the 90s. 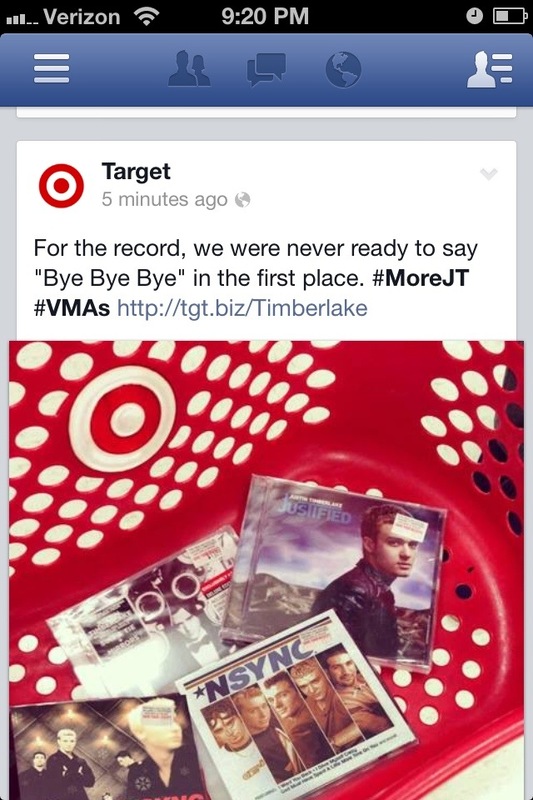 After seeing N*Sync reunited for the first time in years, Target reminded its Facebook fans Target still sells their CDs. The resulting post was a win. Why? Girls everywhere were reminded of their younger years. When this happens, they buy things. Like old CDs. I’m sure target saw sales increase on something they haven’t sold for some time.